This is not a pop up ad for Kellog’s, this is my parent’s pantry. As kids we were literally raised on sugar cereals, getting our morning sugar-smack fix from sweet-talking pushermen like Lucky the Leprechaun and Tony the Tiger, leaving nothing but funky-colored milk in our wake. 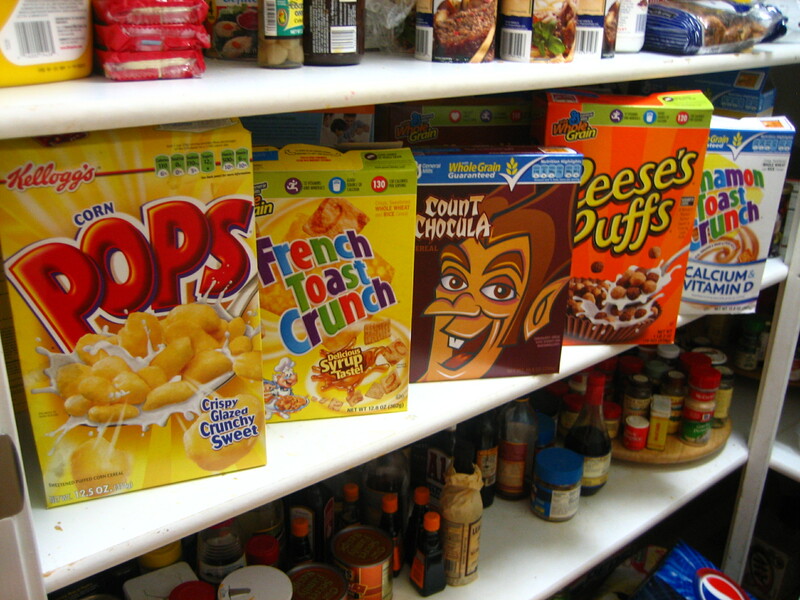 We had an entire cabinet, three shelves high, devoted to every character-backed, FD#4-colored, glazed, frosted and sugared cereal on the market. My friends loved it and often came over just to smuggle out baggies filled with their own technicolor melange of hot pink marshmallow stars, crunchy O’s and chocolate flakes. On a trip home I discovered that old habits die hard as my parents still stock up on a few childhood options among the healthier cereals they eat. After some asking around, I learned that some of my older siblings still indulge in a occasional bowl of Fruity Pebbles, BooBerry or Apple Jacks, which only perpetuates the habit (and I have to admit I can’t resist an open box of Peanut Butter Cap’n Crunch). But still, are this many boxes necessary? Maybe it keeps ’em feeling young. Either way, I have to admit that I am sort of into the new Count Chocula box design. The more variety the better. If your cereal mike isn’t rainbow colored with a hint of chocolate, something is seriously wrong. Kellogg’s and Post should pay you royalties for that entry. I’ll bet the honeycomb honey bee is all abuzz about this. ©Elizabites 2008-2013. All rights reserved. Please send all photo reuse requests to the contact page.